Much of the public discourse on the topic of violence in entertainment is wrapped in hyperbole and controversy. As viewers, readers, and players of electronic media we are often protected behind a layer of abstraction via carefully constructed representation. We use plastic game controllers with abstract buttons and pads, which are devoid of content, to direct action that is inherently disconnected from the physical experiences we live on the screen. The Jack Bauer Training Kit (JBTK), a new physical interface and video game add-on for viewing episodes of the television series “24.” Jack Bauer, a fictional character in this series, is notable for using torture as a method for extracting information from “bad guys”. Players watch the show until a torture scene starts and can choose to advance the narrative by pouring water onto the hooded face of a physical 10 inch doll bound to a small table by leather restraints. 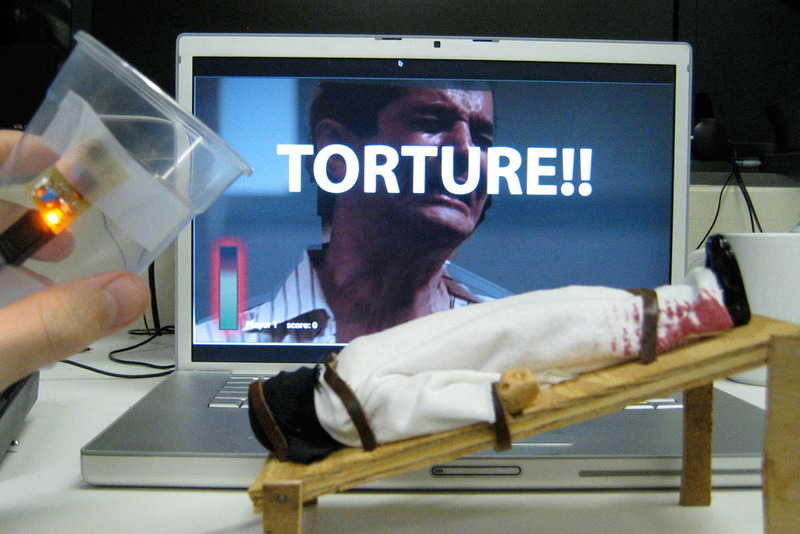 Pouring just the right amount of water gets you a high score, too much and you might kill the “bad guy.” Rather than using an abstract game controller, where the functionality is detached from the stylized actions on the screen, the JBTK mimics the torture applied in the real world by physically instantiating its representations, violence and consequences. This points to an interesting phenomena in American television in the new millennium: it is acceptable for our heroes use torture. But in this case the player needs to clean up the mess when they are done. Zigelbaum, J., Kalanithi, J., Coelho, M., and Wright., A. Violent Interfaces: The Jack Bauer Training Kit. International Symposium on Electronic Arts, ISEA ‘08, Singapore (2008).